Being in the rock crawling/off road industry, I do a lot of traveling. I drive through the remote deserts of Nevada towing thousands of pounds frequently. I also live in the middle of the El Dorado National Forest, and travel windy back country roads daily. Most of my traveling is done at night, when there are lots of animals on the roads. I have been pretty lucky over the years, and have only hit one deer in my entire life behind the wheel. That doesn't mean I haven't had countless close calls with deer, elk, dogs, skunks, and even cows. I have often thought to myself now that I live in the forest, it's not a matter of if I'm going to hit another deer, but when I'm going to hit a deer. With that in mind, I decided to do all I can to avoid costly damage to my truck, and hopefully stay a little safer at the same time. While a nice heavy duty bumper would be nice, it currently isn't in the budget. Those of you who own 3rd generation Dodge trucks might agree with me that the stock headlights are not exactly the brightest. The high beams just don't seem to do the job. The high beams on my Honda Accord are far better. I've tried replacement light bulbs, but they didn't make a noticeable improvement. Clearly the Dodge headlight design is substandard. My Dodge has factory cut outs in the front bumper for driving lights. My truck did not come with the driving lights from the factory, so it has cheesy little slotted plastic inserts in the cutouts. I called up Dodge, and inquired about buying the driving lights. They quoted me about $160 for the kit. While that is pretty reasonable, I wondered what other options I had for more light. I wanted to really light up the desert and those back country roads! I talked to Bruce Wade at Roundeyes.com about the lighting options he offers on his website. It just so happened that he had just brought on a new lighting line by Hamsar that he thought would be exactly what I was looking for. 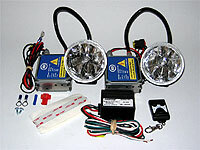 These new lights are 3.5" wide and 4" high, and are known as "HID" lights. We've all heard of HID lights. All the high dollar trophy truck desert racers have them. High dollar luxury cars have them. But exactly what are they, and how do they work? HID (High Intensity Discharge) lights replace the filament of a ordinary halogen light bulb with a capsule of gas. Light is emitted from an arc discharge between two closely spaced electrodes sealed inside a small quartz glass tubular envelope capsule. They require ballasts to operate (much like a florescent light), which supply proper voltage and control current. The amount of light produced is greater than a standard halogen bulb, while consuming less power, and more closely approximating the color temperature of natural daylight. Ok, but what makes them so great, you ask? More light output. The HID lamp's lumens per watt (LPW) efficiency is roughly six to eight times that of an incandescent lamp. The Roundeyes HID lights are only 35 watts, but put out 300% more light than your average 100 watt KC type halogen off road light! Whiter light. The color temperature of HID lighting more closely approximates the color temperature of natural daylight than a halogen system, which appears yellowish in comparison. So for example's sake, say a 300 watt halogen light may put out the same amount of lumens as a 35 watt Roundeyes HID, the HID will appear brighter and will be easier on your eyes than the halogen light. Longer Service Life. An HID lamp will last, on the average, 3 to 5 times as long as a halogen bulb. They sound great on paper, but are they really worth the high price tag? I was skeptical. Luckily for me, Bruce lives not too far from me, and he let me take his Ford F350 for a spin at night. His truck is outfitted with the same HID lights I was interested in, so I could put them to the test and judge for myself. After a spin up twisty highway 193, I was sold. The next day we went to work installing the lights. Since I wanted to put them in the factory cutouts in the front bumper, it was going to take some minor fabrication to build mounting brackets since these were not the factory lights. I went down to the Dodge dealer and bought a pair of the factory driving light plastic inserts so that the install would look as clean as possible. At $35 each, I had a little sticker shock, but then again when don't you get ripped off buying parts at a dealership? Once we popped out the original plastic slotted inserts, and replaced them with the new driving light inserts, we mocked the HID lights into place to get an idea of how to make the mounting brackets. The HIDs are not the exact size of the inserts, but I think they are close enough that they still look really good. There is a small gap between the lights and the inserts. After some head scratching, and a couple beers, we decided the easiest method was to take a couple of pieces of 1" 3/16 flat strap and make mounts out of them. With couple of bends made in the vise, we had some simple brackets that would work perfectly. Once we had the brackets and lights mocked into place, we marked where we would need to drill holes in the flat bar to mount the lights. Ok, so we where lazy and welded them. I'd recommend taking the time to drill and bolt them, though! Once we were sure of the bracket and light locations, we welded the brackets into place. Once the brackets were welded into place, the lights were bolted on. Now the wiring. The Roundeye HID lights come with a snazzy remote control for your key chain to turn the lights on and off. I decided I wanted to wire the lights to my high beam circuit, so they would simply come on when I turn on my high beams. The wiring was simple and straight forward, and only took about 10 minutes. Hook the power wire to the battery, hook the green wire to the high beam circuit, and hook the black wire to ground. Now that's simple! In the photo you can see I used large industrial strength zip ties to mount the ballasts to the truck. I'm sure there's a better, cooler, cleaner way, but I like the easy way out! I've had my Roundeyes HIDs for about 3 months now. I can definitely say without a doubt that these lights are awesome on windy country roads. The white light they kick out brightens up the road like daylight. Keep in mind these lights are designated as off road only lights, so using them on the road is at your own risk. I recommend using them only in remote areas. To disable them from my high beams, I can simply use the remote control to turn them off. Driving across the Extra Terrestrial highway in Nevada, I was very impressed with their range. I did pull over and re adjust them upward a little more so that I could get a further beam into the black desert night. Once I made the re adjustment, I felt confident in traveling 75mph across the desert without worrying about a cow popping out of the dark. So are these lights worth there price tag? The cheapskates among us may not think so, but for the mid to high end user who wants the best lighting in a very compact size (perfect for a sand rail or a blingin' trail machine!) these lights are definitely the ticket. Roundeyes.com also sells replacement headlights for Toyota trucks, Jeeps, Land Cruisers, etc. They have a great selection of LED lights, rock lights, and more.